In a striking landscape close to the banks of Olfusa river in Southern Iceland, the Fosstun Apartments Hotel in Selfoss offers visitors a clean, modern and affordable base from which to discover the area. Reykjavik is just 50 km (31 miles) away and with excellent transport links, the town has become a commercial hub. Professional visitors on business will find this competitively priced accommodation convenient for a number of corporations in the area. Selfoss also offers restaurants, supermarkets, banks, a bakery and a cinema within easy reach of the residence, whilst sporting types will find plenty of opportunity for fishing, swimming and golf. Staff will be delighted to assist you throughout your stay, and to offer advice on car rental and local information. If you are here to work, then complimentary wireless Internet access is available in the rooms and the lobby. 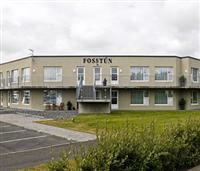 Visitors to Selfoss have a warm and friendly welcome awaiting them at the Fosstun Apartments hotel, with contemporary yet inviting interiors. The building was constructed in 2004 and is wheelchair accessible. For your business trip or holiday to Southern Iceland, look no further than this affordable property.